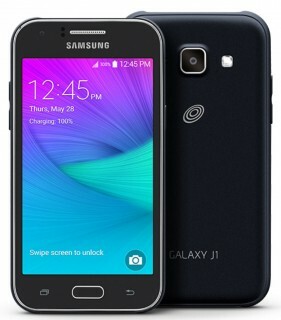 Samsung today published details about the Galaxy J1, an entry-level handset headed to TracFone. The J1 features a 4.3-inch screen, 1.2GHz quad-core processor, 5-megapixel main camera with LED flash, and 2-megapixel user-facing camera. The J1 can capture 720p HD video. The phone supports Bluetooth and WiFi. It ships with Android 4.4 KitKat. Pricing and availability details weren't immediately released. TracFone is a prepaid provider that sells phones via Walmart stores. 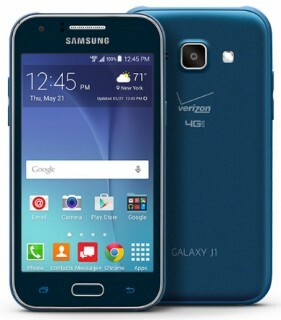 Verizon Wireless recently added the Samsung Galaxy J1 to its lineup of prepaid handsets. The J1 is a compact, entry-level Android smartphone. It includes a 4.3-inch WVGA display, quad-core 1.2 GHz processor, 1 GB of RAM, and 8 GB of storage. The phone supports microSD memory cards up to 128 GB. The main camera sensor captures 5-megapixel images and records 720p HD video, while the selfie camera captures 2-megapixel images. The device supports Verizon's LTE 4G network in addition to WiFi and Bluetooth 4.1 Low Energy. It runs Android 5.0.2 Lollipop with Samsung's user interface elements and applications. Verizon is selling the Galaxy J1 for $99.99.